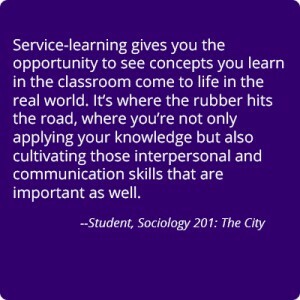 Providing information about service-learning in the course syllabus offers students clarity about what service-learning is, the expectations for students’ engagement in service-learning, and how their community work will be integrated into their classroom experiences and assignments. The Carlson Center offers template service-learning language for your syllabus focused on explaining service-learning conceptually and logistically. Please also be explicit about how service-learning is integrated into the classroom experience, assignments, and grading. 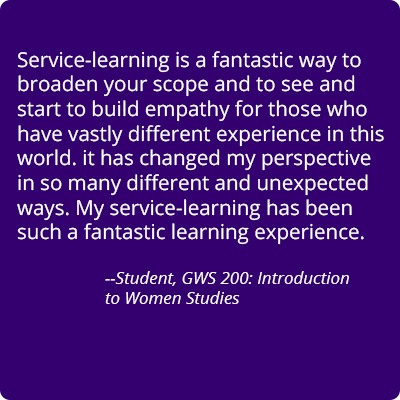 The Carlson Center collects service-learning position descriptions from community partner organizations and matches them to courses. Faculty see the organizations and positions matched to their courses, ensure all of their students are registered for positions (as needed), and review end-of-quarter student service evaluations submitted by partner organizations. 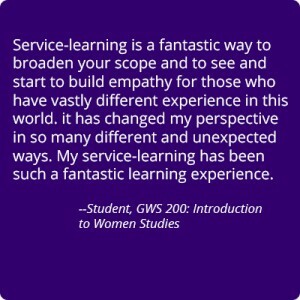 Students browse and register for a service-learning position which they will commit to for the quarter. 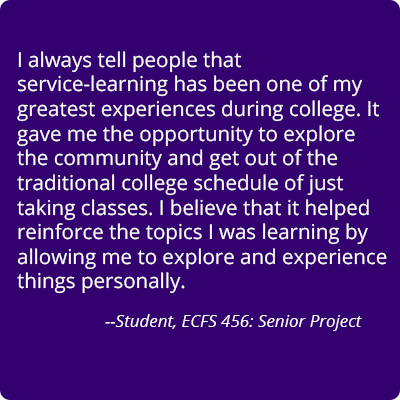 Community partners access lists of service-learning students and complete brief evaluations (see more information below). Click here to access Expo. Open the Prezi used for in-class presentations! Carlson Center staff will provide a 15 minute presentation to your students during the first week of the quarter. 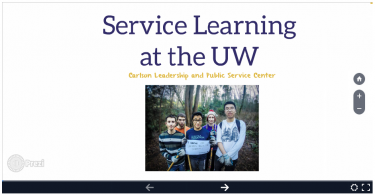 The presentation will provide an overview of service-learning and logistics of how to successfully register and get connected to a regular, weekly service-learning experience. There will also be time to answer students’ questions about engaging in service-learning. You can familiarize yourself with our presentation content through the Prezi we use to share information, or through this video. Please note this presentation is not meant to replace the faculty’s articulation of the importance and role of service-learning in the course and how service-learning connects to assignments and grading. The Carlson Center is not currently offering workshops for service-learning students. We hope to pilot a revised curriculum for this workshop series soon. 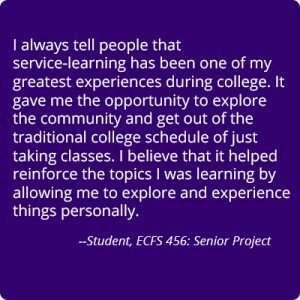 Students who are already engaging in community-based work that aligns with the learning goals and objectives of the course, and have received faculty approval may complete a self-placement form. Information for faculty about approving self-placements – including criteria for approval and process-related instructions – is available here. A few weeks prior to the end of the quarter, the Carlson Center will reach out to site supervisors at the organizations at which your students are serving, to request that they complete a brief evaluation of each students’ efforts. These evaluations are often used to inform students’ grades. The questions included in the evaluation – which is completed electronically, through EXPO – can be referenced here. The Carlson Center will do multiple rounds of follow-up to organizations, to try and ensure evaluations are complete by the end of Finals Week.